The first season of Netflix’s surprise hit Stranger Things left us with a lot of questions. Is Eleven stuck in the Upside Down (Maybe)? Will Barb come back (No)? What about Will’s weird slug thing (No clue)? However, Saturday Night Live chose to answer the biggest question of all: Where the heck were Lucas’ parents? The second episode of the current season, hosted by human body pillow Lin-Manuel Miranda, showed the three Musketeers (and Eleven) trying to find Will in the Upside Down. This could mean part of Season 2 takes place in a flashback, or Will again gets caught on the other side- or it’s a comedy sketch and I’m reading way too much into it. 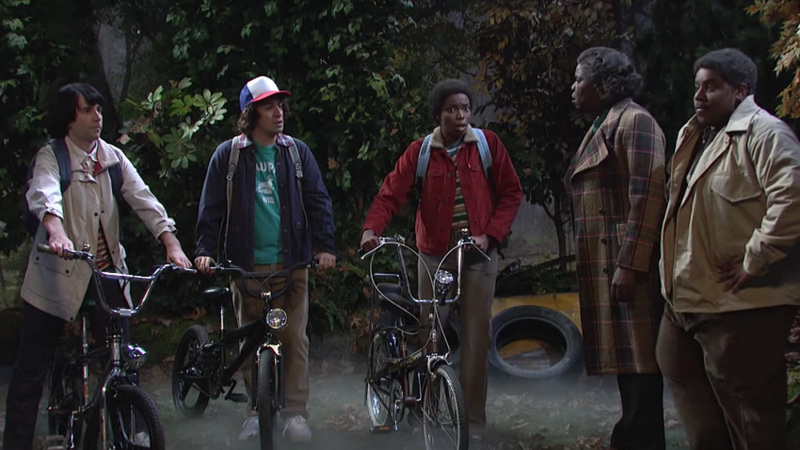 As the kids get ready to search the woods, in pop Lucas’ parents, played by Leslie Jones and Kenan Thompson. Where have they been all this time? Were they in the Upside Down and have only just emerged, unscathed? Nah, the writers just forgot to include them. Lucas was a kid without rules, a bandana-wearing vigilante who could stake out a military base for days with no one bothering to ask where he went. In the sketch, Lucas’ parents have apparently had enough of their son playing with these weird D&D-playing kids and want to take him home. When Lucas insists they have to find the monster, his parents remind him that he doesn’t have to go looking for monsters, they’ll find him. Because he’s black. It’s played off for a laugh, including a bit where the parents are afraid of Chief Hopper (aka the least-intimidating sheriff ever), but it brings up an interesting point. A lot of black parents discuss having “the talk” with their children about how to act around the police. It shouldn’t have to happen in the first place, but it’s good to see SNL tackling issues of systemic racism. Now, if only they could tackle why Will’s hair looks so silly.